It is a known fact that many people across the USA have had unpleasant experiences when using their toilets to find that snakes, rats, frogs etc have gained access to their homes/offices via the toilet sewerage system. Numerous people have been bitten while sitting on the toilet or trying to remove the vermin from their homes. Rats can easily swim half a mile in open water, can tread water for up to three days and survive being flushed down the toilet only to return once again into the building via the same route. It is possible for a rat to walk up a vertical soil pipe from the sewer, swim through the water filled piping inside the toilet and surface in the toilet bowl. These incidents can be prevented by installing one of our anti-vermin barriers. In addition to vermin control our devices also prevent cross-flow in horizontally opposed connections and reduce backflow of effluent in the event of a blockage. Deter vermin from gaining access to property via the toilet sewerage system. Act as anti-cross flow devices enabling toilets to be fitted back-to-back reducing the space required for pipework to prevent cross-flow. Reduce backflow of effluent in the event of a blockage in the underground drainage system. Assist in flood plain areas stopping solids coming back up through toilet and any vermin trying to force their way out through the pipes. Eliminate the need to dig up roads/walls etc to access the drainage system to remove/bait vermin as the barriers are easily accessible. The barriers are black in color to stop light penetration which attracts vermin in the pipes. The barriers are easily installed and have been tested in excess of 2-million opening and closing cycles and should last 30-years. Spring and hinge are constructed of stainless steel. To install, you will need to remove the toilet and old wax ring, then install the Toilet Barrier, a new wax ring, and then reinstall the toilet. The Toilet Barrier will fit into all 4 inches (110mm) drain pipes, clay, plastic, and cast. The one-way valve will stop the light penetration that attracts rodents and snakes which look for the light source. 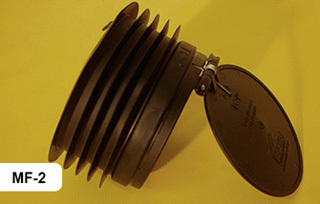 The product will not fall down the pipe due to a gasket which opens the rubber. This can be fitted in seconds and there is no need for a plumber or tradesperson as this can be fitted by anyone. 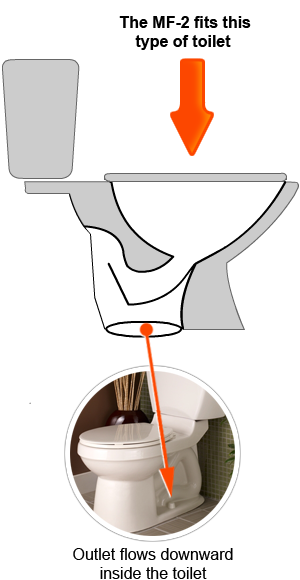 The Toilet Barrier can also act as a solid matter backflow preventer valve. Quantity discounts are available, please call 800-674-3236. ATS provides live trapping equipment, personal safety gear, wildlife repellents, animal deodorizers, wildlife bait and bait boxes, pesticides, prevention products to keep animals out, home products for chimneys and gutters, bat removal materials, rodent traps, and insect removal and prevention products. © Copyright Animal Traps & Supplies. All rights reserved.